Can Regional Effort Uproot Boko Haram in Time for Nigeria Elections? 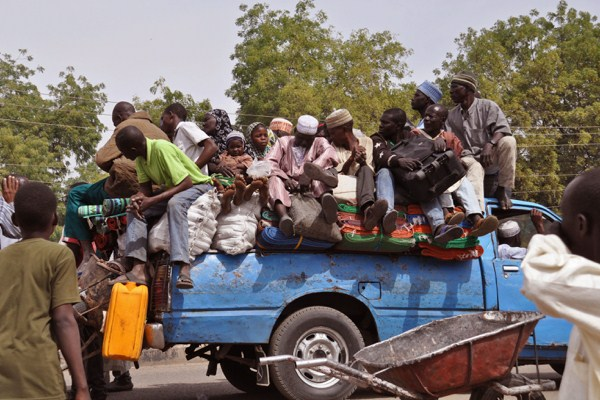 Villagers sitting on the back of a small truck as they, and others, flee the recent violence near the city of Maiduguri, Nigeria, Jan. 27, 2015 (AP photo by Jossy Ola). Last weekend, Nigeria’s electoral commission announced that, contrary to statements made just days prior by the chief of defense staff and the chief of army staff, the country’s security forces could not guarantee the safe conduct of presidential and parliamentary elections originally scheduled for Feb. 14 and 28. The commission postponed the poll for six weeks, the minimum time the security forces say they need to conclude a major military operation against militants from Boko Haram in northeastern Nigeria and before which they would be unavailable to provide security for the elections.